J. Bert Flanegan, a professor of molecular genetics and microbiology in the College of Medicine, is recognized as a world-class virologist and a leading authority on the replication of positive-strand RNA viruses. These viruses cause a wide variety of diseases, including polio, hepatitis, meningitis, encephalitis and the common cold. His pioneering methods, which allow the study of poliovirus reproduction in the test tube, have enabled him to study the molecular biology of poliovirus, the results of which can be extrapolated to other similar viruses. His discoveries simplify research methods that are aiding the development of drugs to inhibit viral infections. Flanegan is using these tools to attack another major human pathogen, Hepatitis C, which currently infects an estimated 4 million Americans and is one of the world’s most costly infectious diseases. One of the companies supporting his research, ViroPharma, sought out his expertise in viral replication for the development of RNA replication assays for Hepatitis C Virus and the related Bovine Viral Diarrhea Virus. A second industrial sponsor, Quadrant, is working with him to develop methods to stabilize viral preparations in the dry state. This work will likely have broad public health ramifications in terms of preparing vaccines for developing countries that lack adequate refrigeration for the proper storage of many of the vaccines currently in use. Flanegan has served the national research community as a permanent member of the NIH Virology Study Section and the NIH Reviewer’s Reserve. He currently chairs the RNA Viruses Division of the American Society for Microbiology and is on the editorial board of the Journal of Virology. “Dr. 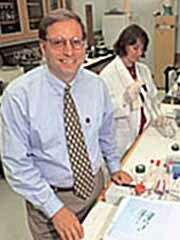 Flanegan is an accomplished researcher with superb academic credentials who enjoys a national and international scientific reputation,” said Richard Moyer, chair of the Department of Molecular Genetics and Microbiology.